Malawi Police in the commercial city of Blantyre have arrested 136 people for the offence of rogue and vagabond. 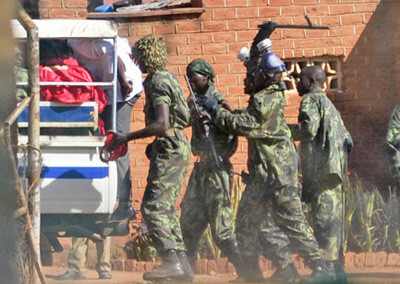 Speaking to Malawi24, Blantyre police spokesperson Elizabeth Divala said out of the 136 people, 26 are women. “We arrested these people around our areas under Blantyre police: Ndirande, Chilomoni, Milale, Soche, Mpemba, Chilobwe, Chirimba and Sigelege,” said Divala. Divala further said some suspects have appeared before court while others are yet to appear in court to answer charges of rogue and vagabond which is contrary to section 184 of the penal code. The law of Rogue and vagabond recently attracted debate as others argue that it discriminates the poor and that it is prone to abuse by law enforcers. A study conducted by the Centre for Human Rights Education, Advice and Assistance (CHREAA) also deemed the law of rogue and vagabond as ‘No justice for the Poor’. Ngankhare muwagwire mfazy idzinthimabe paka kunja mbee mukuremphera kugwira mbamva APA ndye mwaonjenza. Amangomwa mowa limodzi ndi mbava! Ukunenadi zoona mc loud! This law should be submitted for legal review. hahahaha am business man dealer mukidziwa kut dealer amadana nd kuwala shaaaa kma police sitilemeratu ife Dzuka Malawi!!!! Zoti a police amadana ndi oyenda pansi usiku izo zinatukukila kale . Zimayenda usiku koma pa galimoto , a police wo nkumapeleka ulemu. Does FREEDOM do exist in our country? Pin???? 5 bwa?? Ati ku court 10 pin………. Mwalephela kugwila a #cashgate mwati mugwile oyenda usiku. bravo police! tidaunapo ubwino wazimenezi! I dislike the Munthalika’s Government becouse they take Malawians as their garden,in short that is one way of collecting monies. I don’t understand. Why not? Please help me. Is rogue and vagabond an offence of the night? What does the Malawi Constitution say concerning the freedom of movement? Mukumawagwira anthu osalakwa pamene mbamva mukuzipasa sawacha,mukulakwa kwimbili. Samayendera miyendo ya a police,zachamba!! The first democratic country in African but is the most stupid country you can ask,I hate stupid rules. Unfortunately this rogue & vagabond law was made for the poor people because the same night some well to do people were driving in the same Blantyre roads..When the police is busy chasing people in resthouses,The well to do people are in Lodges & Hotels doing the same thing freely..Eeeeish. Our Neighbouring Mozambique athu amayenda pakana utsiku ine ndinadabwa ngati ndikulota even ma Shop saseka koma timati ndi Dziko la Khonda. Kwanthu kuno kwakula ndikubelana ndalama. Kutenga kwa aphawi opeza movutika WHY ??? Mukukhala planet yanji kodi? Masiku ano anthu sagona. 3d century ino koma malawi ayi ndithu. Kupikisana Ndilamulo, Eeeee Umaonadi Kiyama, Apolice Anthuwo Mukawagwila Osamawachita Nkhaza Chifukwa Ena Amakhala Osalakwa. What bout those drivin at night? Good job guys,keep it up!. Chonde chosani chithuzicho kodi mulinacho chomwecho khani ili yonse? Ee malinga ndi khrismasiyi aliyese ali against ndalama apolisi,akuba,osaba onse. Ma roadblok azikhala ndi nthawi yoletsa galimoto kudutsa mpaka kuche chifukwa a armed robbery amagwiritsanso ntchito galimoto koma mumangogwira oyenda pansi okha. And what if you are travelling or coming from a long distance ? The same applies to pedestrians. KUNO KUTHEBA ZAVAKAB ZO NDI NKHANI ZACHIKALE KUNO ANTHU AMAKAYALA MALONDA NGAKALE USIKU MMAWA NDIKUMAWELUKA. KOMA MALAWI DZIKO LOTUKUKA MASANA WOKHA KKKKKK, KUNO DZIKO LIMATUKUKA MASANA NDI USIKU OMWE. Man chauluka mwanena ngati osaganiza. Akamati chitetezo ndichimenecho. Kodi munthu oenda usiku ungamuziwe komwe akupita ndikomwe akuchokera? Bwanji asanakawagwire anthu ma pub ndi ku depot? Achita bwino ndipo asalekeze pomwepo ai. Oyenda pa galimoto usiku amaziwika kumene akupita ? Nanga bwanji samawagwira ? Onse a armed robbery othyola ma bank,filling stations amayenda pa galimoto. mwina amafufuza timaganyu kkkkkk anthu openga inu mwatani kodi? ask them what they search 4?